Encircled by mountains and charmingly situated at the meeting of the Khan and Mekong Rivers, Luang Prabang conveys an atmosphere of remote serenity and informal splendour. The district's old temples and the thriving religious life of its people are its main attractions. Mongols, Khmers and various empires controlled the city-state over the course of its history, and it flourished for a time as the powerful Lan Xang Kingdom's capital. Today, visitors will find a sleepy mixture of cobbled lanes, ancient temples, riverside farm plots, interesting backstreets, French-Indochinese architecture and ochre-coloured colonial buildings. Misty mornings see throngs of barefoot, orange-robed monks leave their monasteries for the streets, where locals gather to fill their wooden alms bowls with rice. Otherwise, unhurried people drift past stalls of noodles, fruit drinks, omelettes and spicy papaya salad. All in all, the UNESCO World Heritage Site gives visitors a taste of the real Laos. Tourists shouldn't miss the chance to visit this unique and fascinating city. 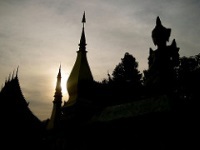 We are looking for contributors for our Luang Prabang travel guide. If you are a local, a regular traveller to Luang Prabang or a travel professional with time to contribute and answer occasional forum questions, please contact us.